I’m writing today announce my latest and most ambitious rock n roll project called The Good Guys. We are planning to release this album by the end of 2019 and recording for this has gotten underway at Paul Smith’s state-of-the-art Eight Days a Week recording studio in Northumberland, PA. 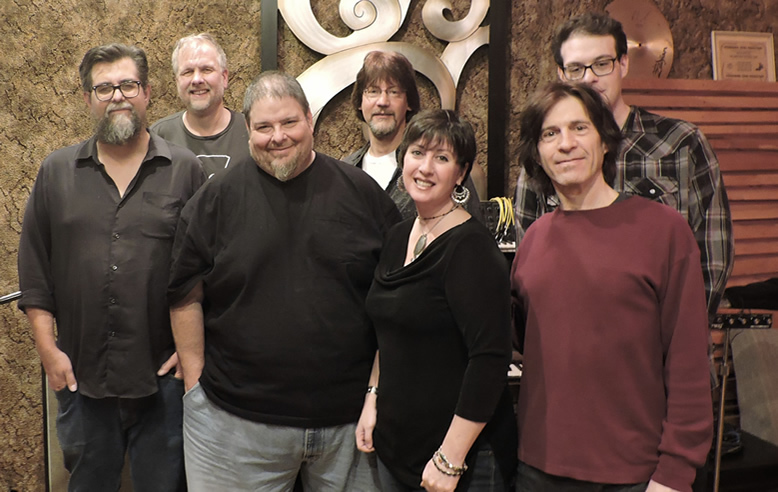 In fact, I celebrated my 50th birthday last week by doing an incredibly productive recording session with Paul along with drummer Ron Simasek, vocalist Mycenea Worley, guitarist Phil Brosius, multi-instrumentalist Bret Alexander and my son, audio engineer Jake Albano. Some of you may know Phil from his extensive work with many local bands and Mycenea, an award winning singer-songwriter and current member of the group The Pleiades. You may also remember Bret, Paul and Ron as long time members of the internationally acclaimed rock group The Badlees and current members of the rock group Gentlemen East. So I am incredibly humbled to have this posse of top-notch musicians and production team with over a century of combined experience at all levels of the music industry. The Good Guys will be the fourth overall album of original music under the name Sinclair Soul. The Journey was completed in early 2017 and released in June of that year, last winter we recorded a second album Reflections of Relevance (released this past March), and over the summer we produced and released the third album, Nine Fine Lines. This new album will feature quality songs of an interpersonal nature with topics ranging from the serious and somber to the joyful and fun. I’ve written these songs over the past year and have been performing them acoustically throughout 2018 and now, with the addition of the quality musicians and vocalists, these songs will grow sonically to include entertaining and rewarding elements of vast musical genres such as blues, folk, country, jazz, and of course, rock n roll. All of the previous work I’ve done has been 100% self funded, but with this new and ambitious The Good Guys project, I have launched my first ever crowd funding campaign through Patreon. With this, I’m asking for a very modest monthly contribution in exchange for exclusive content that is not available anywhere else. I’ve set up three basic tiers with each progressively giving access to more exclusive content. The most modest $3 “Tin” tier includes an archived video of live performances of songs not seen before on video, many of which are cover tunes of songs I may have only performed once or twice, so these are fun little gems. The middle tier is “Copper” at $5 per month and includes the aforementioned video series plus a second video series of special, storytelling and behind-the-scenes videos as we make this new music and/or reflect back on previous original songs. The current top tier is “Bronze” at $7 per month and the level at which I encourage you to contribute. This includes the previous two video series along with digital copies of the first three Sinclair Soul albums. Starting in January 2019, these will be released one per month to Bronze level patrons and, along with the music, will include additional digital material such as artwork and promos. If you are interested in becoming a patron, or simply exploring more on this campaign, please click here. As part of December’s exclusive content, I’ve included a video of a song unlike any I have written before – a Christmas song. To view this, please sign up today as a Copper or Bronze patron. You can also hear me play this song, along with several traditional holiday tunes, this coming Friday night (December 21st) during my annual Sinclair Soul Christmas show at Cornerstone Coffeehouse in Camp Hill, PA from 7:30-9:30 pm. I hope to see some of you there. Thank you for your time and consideration and have a very Merry Christmas. Analysis: The very last song to use the old harpsichord, an instrument which pre-dated even the earliest songs that I wrote (I believe I purchased it when I was 16 in 1984). The song itself has a decent vibe due to the strong bass line, but some weaker vocals that kind of fall off late in the second verse, indicating that the song was never properly finished. Please offer your own analysis of Fear by leaving a comment in the box below.